The Apgar score for newborn babies is a rather novel concept if you think about it. This fast, simple physical assessment immediately following childbirth and repeated at five and ten minutes thereafter determines if babies are ready to meet the world without additional medical assistance. David Schmitz continues to see patients as associate director of Rural Family Medicine at the Family Medicine Residency of Idaho. What if there was a similar test for hospitals to assess readiness for recruiting physicians? That is precisely what Dave Schmitz, M.D., a family physician from Boise, Idaho, wondered, when he took a new job as associate director of rural family medicine at the Family Medicine Residency of Idaho. After years of observing Idaho communities struggle with recruiting health providers, Schmitz envisioned something new. Something based on quantifiable data. Something that incorporated the whole community. Something that shows people on graphs and charts where they are and how to achieve their goals. Enter Ed Baker, PhD, director of the Center for Health Policy at Boise State University. Schmitz brings experience from the trenches, Baker brings the research know-how, and together they’ve developed the Community Apgar Questionnaire (CAQ), an innovative, evidence-based way for health care facilities to see how they stack up in the eyes of the health care providers they are recruiting. The Community Apgar Questionnaire got its start in 2007, when Baker and Schmitz received funding from the Idaho Office of Rural Health and Primary Care to develop a tool that identifies and weighs factors important to communities in recruiting and retaining rural family physicians. The 50-factor CAQ contains questions about geography, economics, scope of practice, medical support, and hospital and community support. 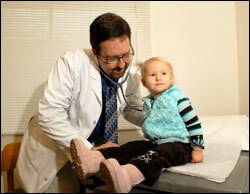 It is typically administered at a hospital, where Schmitz acts as a physician interviewing for a job. He meets with administrators, physicians and staff, and also gets to know the community in the way that a visiting physician would typically do—perhaps meeting principals, real estate agents and pastors, among others. The responses are recorded, the results are analyzed, and a return visit is made to present scores to hospital leadership, board members and key community decision makers. This program is funded by the Idaho Office of Rural Health and Primary Care for use in each critical access hospital in Idaho over the next four years, but is also ready for use beyond state lines. But the CAQ doesn’t end there. Baker and Schmitz also identify areas for improvement and help to address gaps and priorities. So, if a community has a fantastic school system and is home to parks and recreational activities, those are highlights to feature for physicians with young children. But if the physician would be on-call every evening and weekend (an unattractive option), Baker and Schmitz help communities explore solutions such as on-call sharing. Baker and Schmitz return 12 months after the first assessment and complete another CAQ, followed by another return visit and presentation. This time, they also measure how well the community achieved its goals. While Baker and Schmitz have only done their assessments in rural facilities, they are confident the process can transfer to urban environments as well. They also have begun the development of CAQ tools for Community Health Centers and the nursing workforce. To learn more, contact Dave Schmitz, M.D., FAAFP, by phone: (208) 367-6468 or by email: dave.schmitz@fmridaho.org; or visit the Idaho Rural Outreach website. Adapted from an article that originally appeared in the June 2009 issue of Health Workforce News, published by the Health Workforce Information Center. This entry was posted in Around the Country and tagged Healthcare workforce, Idaho, Physicians, Recruitment and retention of health professionals on August 21, 2009 by Rural Health Information Hub.